Sadly, since the failure of the National Hockey League Cleveland Barons in 1978, Pro Hockey has been very much a minor sport in the Cleveland area, with several teams coming and going.. The Lumberjacks had some success, but were ultimately sold to an owner with short finances and folded (along with the whole league).. The San Jose Sharks brought a second American Hockey League Barons in from 2001-06, but once George/Gordon Gund sold their Hockey interests, the team lost interest in being here and moved to Worcester, Mass after the 2005-06 season.. The current Lake Erie Monsters (Still think Cleveland should be in the name somewhere) have been among the top teams in AHL attendance the last few years.. In saying all that, I want to look back to a time where Minor League Hockey was major sports news in Northeast Ohio..The Original Cleveland Barons of The American Hockey League were the classiest organization in the AHL..Players would spend years in Cleveland, preferring the Barons to life in the NHL.. The Barons won numerous division titles and 9 Calder Cups from 1937-73..The Plain Dealer and the other major Northeast Ohio Newspapers covered the Barons with front page stories and coverage rivaling the Indians and Browns for the most part..The 1949-50 season was 2 seasons removed from a 1948 Calder Cup Title during Cleveland's "Championship Season". 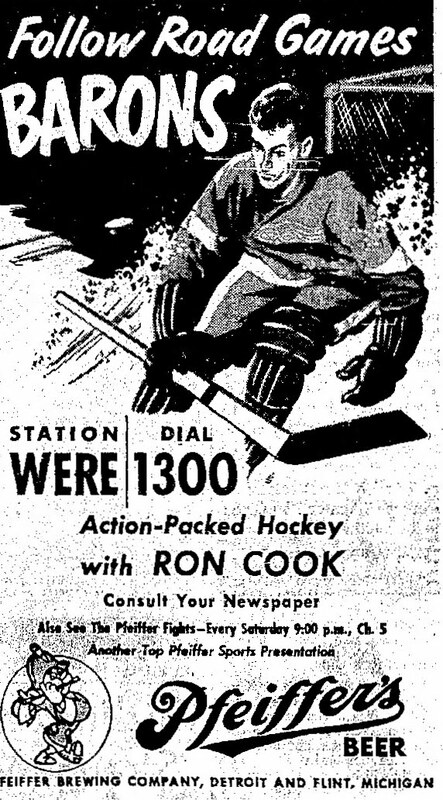 The Barons were represented by a six station radio network with Ron Cook as Play By Play man.. Sponsor was Pilsener Brewing Company, whose "P.O.C." (Pride Of Cleveland) Beers were big at the time..
Games were also televised over WEWS-TV 5..there was a schedule of 20 home dates televised-19 Saturday and one Sunday Afternoon..A couple of fellows named John Foley and Len Roof did play-by-play and color, respectively. Can't find much solid Info on Foley, though he appeared to do Barons TV for at least 2 seasons. Roof appears to have been an amateur athlete that turned to broadcasting for awhile. He subbed for Bob Neal on TV Indians Games in this era when there was a controversy between rival breweries sponsoring Neal's other radio commitments on one hand, and the Indians on the other..Roof also did local College Football on WJMO and WERE.. The way games were broadcast in this era was much different than today..On both Radio and TV, Only the third period was broadcast, meaning that most often the broadcast/telecast would not start until 9:30 or 10:00 or later for night games..I guess it wasnt worth it for sponsors to buy a 2-3 hour window for games.. It would seem that WJW Radio had a pregame show at 9:45 with the action starting at 10. WEWS would join in progress at 10 for the Saturday games.. There was also many Saturday Nights that a wrapup show. "With The Barons" would air late at night on Channel 5.. As for the Barons themselves, they finished first in the AHL Western Division with a 45-15-10 record for 100 points, 19 points ahead of the second place Indianapolis Capitals, though the Capitals beat the Barons 4 games to 0 in the Calder Cup Finals in 1950..This is the only Cleveland Pro Hockey Team ever to hit 100 points during a regular season..
Goalie Johnny Bower, after many years in Cleveland, would go on to a Hall Of Fame Career for the Toronto Maple Leafs. 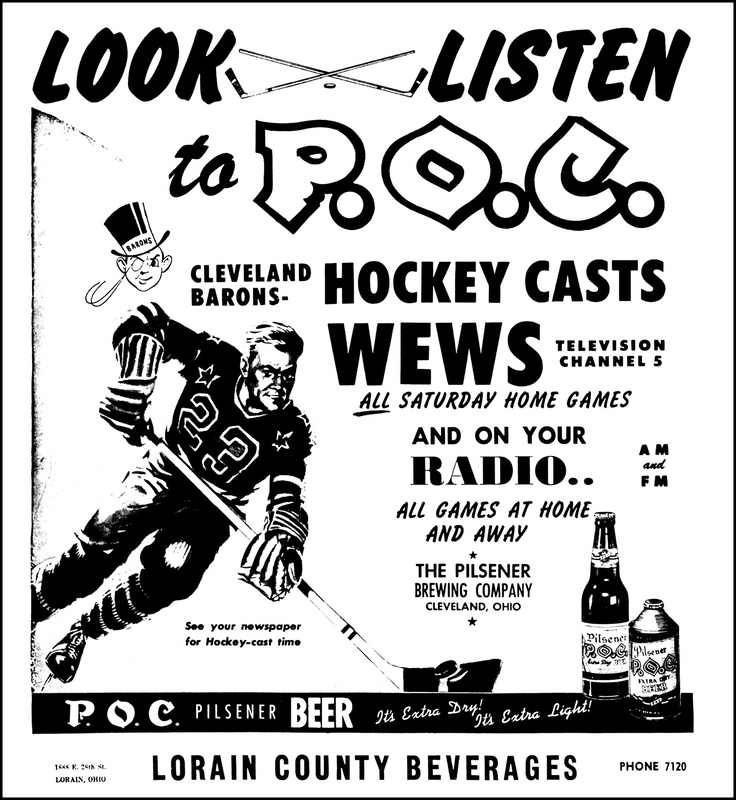 Cleveland Arena Program Cover, 1949-50..
Below is the Barons' Record for the televised games only. 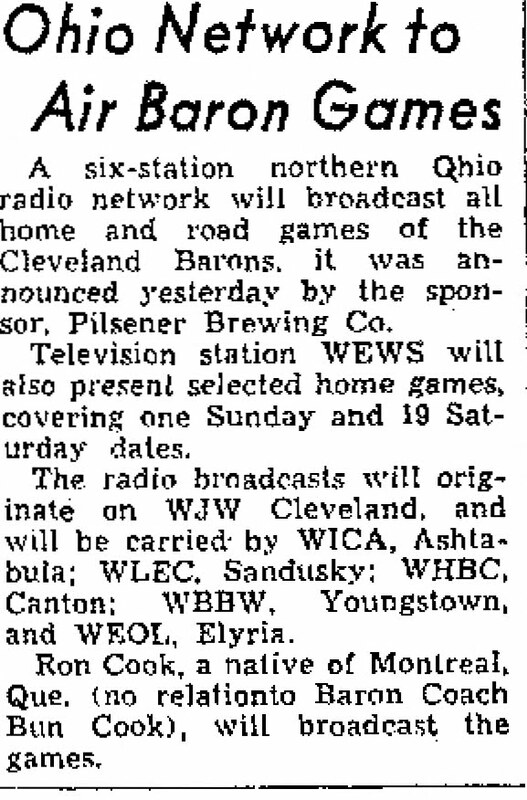 As indicated above, all telecasts were at home, though WJW Radio and its Barons Network broadcast all games, Home and Away..A couple of notes:The team was 18-1-1 in these games, and average attendance was 8,684 fans for the televised games..Listing includes W-L, final score and attendance for each game. 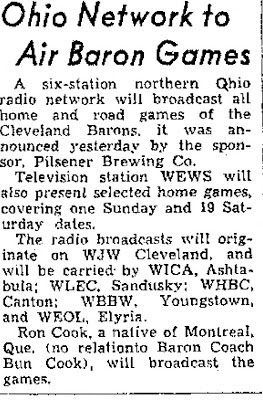 Harry Jones, (Later Sports anchor-Indians announcer for WJW-TV 8) Browns Writer Harold Sauerbrei and John Dietrich filed stories on these games for the Plain Dealer.. 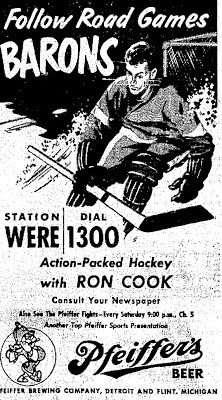 Plain Dealer Ad on October 12, 1949 for the WJW Radio Games with Ron Cook..
Another PD Ad (December 10, 1952) for a different Barons Season (1952-53) Ron Cook was at the microphone for Barons Games well into the mid 1950's at least.. 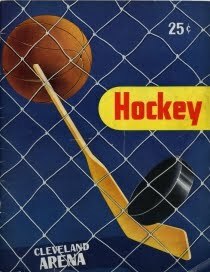 I realize people here are'nt big hockey fans for the most part, but I wanted to show in some way, just how big the sport was in The Cleveland area, and try to dig out some history that may be lost otherwise..It would be great to find some old radio games from this era, or even the 60's-early 70's..